THE CARTOONIST CONSPIRACY NEVER SEEKS YOUR DONATIONS. We aren’t even a real organization, and we would probably just blow it all on beer, anyhow. In spite of this, the wonderful things we do would not be at all possible without the help of the below organizations. We are remarkably fortunate to have their support and collaboration. Please seriously consider donating to all of them. Thanks! 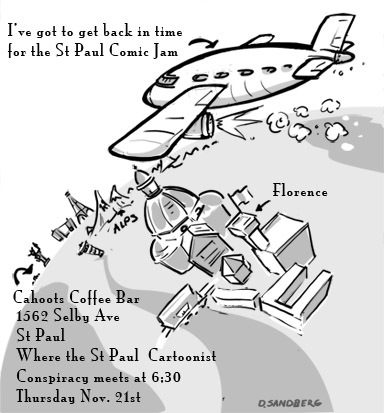 Altered Esthetics, the non-profit gallery that has helped organize so many wonderful comic art projects with the Cartoonist Conspiracy, including the recent Rock Ink Roll, is currently seeking funds to help print their calendar for next year. Please hurry on this one as it is a Kickstarter with only 10 hours to go at the time of this posting. If you are too late to help with their Kickstarter, you can donate through their site here. The Minnesota Center for Book Arts, the non-profit organization that hosts us for our monthly open studios and has provided a space for our 24 Hour Comic Day and Minicomics Day events, is currently soliciting donations. Note that they have always provided their amazing space free of charge. The wonderful bi-annual Minneapolis Autoptic festival (which recently became a non-profit) is starting to plan their 2015 event (which is going to be two days this time! ), and needs your help getting it off the ground. We are incredibly fortunate to have this amazing event happening in the Twin Cities… please help them make it a reality. 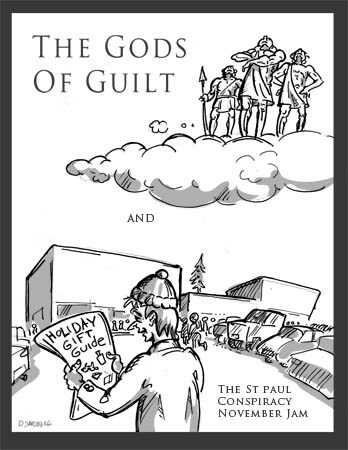 RAIN TAXI, the local literary oragnization/publication which organizes the annual Twin Cities Book Festival, and who organized the fun Analog Cave at the Northern Spark festival which we participated in last year, is currently seeking donations. Come on down to the open studio on Saturday, November 9, noon to 4 pm, at the Minnesota Center for Book Arts. Meet, talk, and draw with a few of your fellow cartoonists. We’ll be at the flexi-space (low tables). Saturday, November 9, noon to 4 pm, at the flexi-space (low tables).